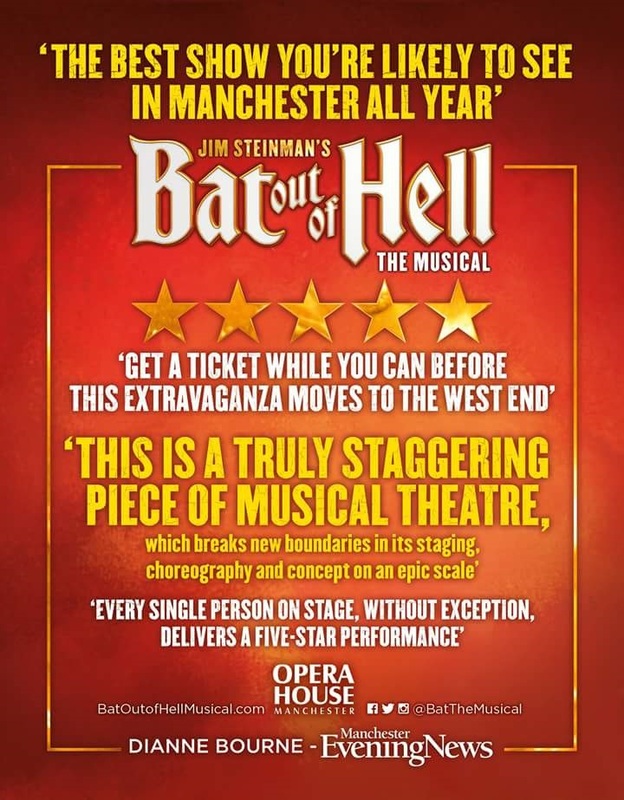 While it's known as one of the most iconic rock albums of our time, Meat Loaf’s Bat out of Hell was originally written as a musical by king of the power ballad, Jim Steinman. Now, 40 years on, his work is brought memorably to life as a raucous rock opera for a world premiere run here at Manchester Opera House - and boy, have the team gone hell for leather with this one. This is a truly staggering piece of musical theatre, which breaks new boundaries in its staging, choreography and concept on an epic scale, that during a month of preview shows at the Opera House has already been winning an army of devoted fans. It is not hard to see why more than 25,000 people have already booked to see this extravaganza - and why I suspect many thousands more will come to this musical in the months and years to come. This is a veritable feast for the eyes at every twist and turn of what is a dark, daring and provocative work sharply directed by Jay Scheib. In an age when big names are often deemed more important than star presence in a musical, it’s refreshing to watch a cast where every single person on stage, without exception, delivers a five-star performance (watch out for the staggering trio of vocalists on Objects in the Rear View Mirror for proof of that). Although in leading man and newcomer Andrew Polec, a true star is born. From his menacing opening monologue on stage, Polec brings an unnerving and intoxicating intensity to the role of Strat, the lost boy leader of a sub-culture where wild teen rebels stay 18 forever in the post-apocolyptic landscape of Obsidian. With flashes of Sid Vicious, Iggy Pop, and the flamboyant strut of Meat Loaf himself, the raw, pulsating energy and vocal dexterity of Polec in this role is quite extraordinary. His love story with Christine Bennington as Raven bristles with electricity and delivers stunning vocal duets on those big, meaty Meat Loaf masterpieces. And he helps roar the musical into raucous life, revving up a Harley Davidson as the Wasted Youth perform their curling, writhing and pounding dance moves around the stage. With Gollum-like intensity (well, Gollum with a gym pass) his brooding eyes lock on innocent ingenue Raven, daughter of fearsome overlord Falco (Rob Fowler) who aims to protect her from the outside world in his version of an ivory tower at their palatial home with suffocating clutches. It is impressively created on stage with use of a huge video screen and on-stage camera man to create a Big Brother-esque reality show within a show in Raven’s bedroom. It's just one special part of a multi-layered set brought spectacularly to the Opera House by designer Jon Bausor. Falco’s world-weary relationship with partner Sloane (Sharon Sexton) brings an injection of humour, and one of the show’s most jaw-dropping sequences as they frolic (to the embarrassment of their daughter) in an old cadillac which she pushes all the way off stage into the orchestra pit. The unconventional love stories are completed by the stunning Danielle Steers as Zahara and Dom Hartley-Harris as the lovelorn Jagwire. Their first half duet to Two Out of Three Ain't Bad is impressive enough, but the second half’s thrilling Dead Ringer to Love could not have been more exciting if even Cher and Meat Loaf themselves had burst through the bar doors. The musical cleverly reaches its peak by delivering two of Meat Loaf’s biggest hits - It’s All Coming Back to Me Now and I Would Do Anything For Love at the end of the show - ensuring the crowd are well and truly whipped into a finale frenzy. Although the opening night audience don’t even wait for the cast to return to stage for the curtain call to leap to their feet for a standing ovation. This is, quite simply, the best show you’re likely to see in Manchester all year. And as it’s running at the Opera House until April 8 there are really no excuses - get a ticket here while you can before this extravaganza moves to the West End.